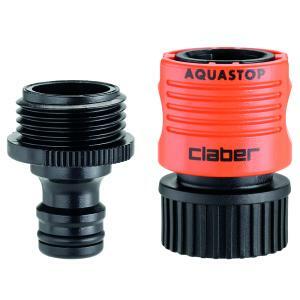 The Quick Connector for garden hose to accessory set easily connects a garden hose to spray nozzle and/or sprinkler accessory. Set includes one female hose end connector with Aquastop feature for connecting to your garden hose and one male adapter for connecting to the accessory. Connector and adapter snap together using spring compression. Water flow shuts off when uncoupled making changing accessories easier without shutting off water at the spigot.